Steam began accepting pre-orders for Call of Duty: Advanced Warfare last week. The shooter hasn't gotten a warm greeting from PC gamers. 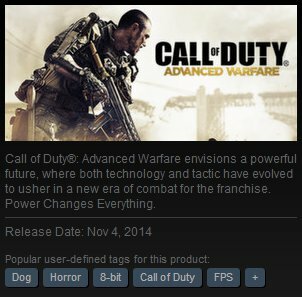 Players have been trolling the Call of Duty: Advanced Warfare product page through Steam Tags. 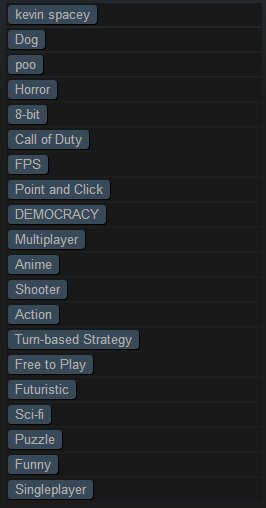 Steam Tags, added to the storefront in February, allow players to categorize products for easier browsing. For example, if you want a game with split-screen multiplayer, you could just look up games with the "local co-op tag." The "FPS" and Call of Duty tags are useful. The "8-bit" and "Horror" tags are just wrong. "Dog," meanwhile, is a joke about the canine companion in Call of Duty: Ghosts' campaign. Are tags like "Kevin Spacey" and "poo" funny? Absolutely. The whole point of Steam Tags, though, is to inform gamers when they're making purchases. The point isn't to let players hang signs on games they don't like. Valve does do some moderation. For example, when Steam Tags first went live, Gone Home was tagged "not a game" and "bad" among other things. Those tags have since been removed, though "Walking Simulator" still remains on the listing. These tags need to be cleaned up at a faster rate, though. The Steam Tags feature is still in beta, according to Valve. I'm curious what their long-term plan is. Will they wait a few months, find out the most widely-used 100 tags, and restrict players to selecting from that list instead of making their own? That might be the cleanest solution because they won't have to run around cleaning up tags anymore. Even if Valve adopts a more restrictive approach to Steam Tags, gamers will still have a chance to voice their opinions on games. Last year the store added user reviews to the bottom of each game's listings. They give players an opportunity to trash or praise games, sometimes in hilarious fashion. I'm sure we'll see plenty of colorful reviews for Call of Duty: Advanced Warfare when it launches in November.